Other Information: Each packet contains: potassium 10 mg, sodium 23 mg; phenylketonurics: contains phenylalanine 13 mg per packet; store at controlled room temperature 20 degrees-25 degrees C (68 degrees-77 degrees F. Protect product from heat and moisture. Misc: Acetaminophen - pain reliever/fever reducer. Diphenhydramine HCl - antihistamine/cough suppressant; phenylephrine HCl - nasal decongestant. Infused with chamomile & white tea flavors. Nasal congestion; sore throat pain; cough; headache; body ache; fever; runny nose; sneezing. Theraflu provides powerful relief from your severe cold and flu symptoms. Read all warnings and directions on carton before use. Keep carton for reference. Do not discard. Questions or comments? Call 1-855-328-5259. Other Information: Store between 68-77 degrees F (20-25 degrees C). Misc: 600 mg guaifenesin. Relieves chest congestion. Thins and loosens mucus. Immediate and extended release. Health. Hygiene. Home. Questions? 1-866-Mucinex (1-866-682-4639). You may also report side effects to this phone number. Unique Bi-Layer Tablet: Immediate-release layer/ Extended-release layer. Choose from the Mucinex line of products to treat your symptoms. 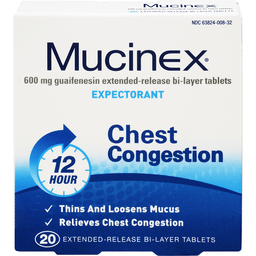 Mucinex: relieves chest congestion; thins and loosens mucus for 12 hours. 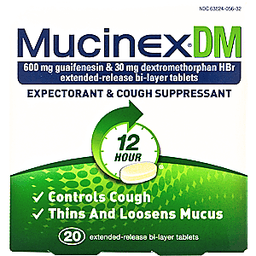 Mucinex DM: controls cough; thins and loosens mucus for 12 hours. 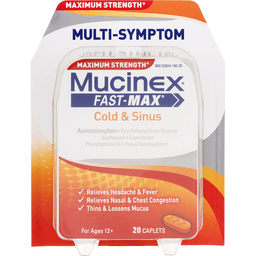 Mucinex D: clears nasal/sinus congestion; thins and loosen mucus for 12 hours. 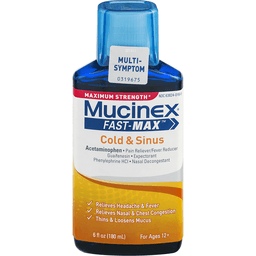 Please visit our web site www.mucinex.com. Made in England. Other Information: Each 30 ml contains: sodium 92 mg. Store at room temperature and do not refrigerate. Misc: Nighttime relief. Acetaminophen, phenylephrine HCl, doxylamine succinate, dextromethorphan HBr. Headache, fever, sore throat, minor aches & pains. Nasal/sinus congestion & sinus pressure. Sneezing, runny nose. Cough. Parents: Learn about teen medicine abuse. www.StopMedicineAbuse.org. www.vicks.com. Other Information: Each 20 ml contains: sodium 12 mg. Store between 68-77 degrees F (20-25 degrees C). Dosing cup provided. Do not refrigerate. Misc: For ages 12+. Maximum strength (per 4-hour dose). 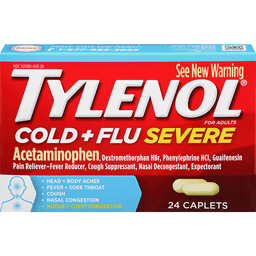 Acetaminophen - pain reliever/fever reducer. Dextromethorphan HBr - cough suppressant. Guaifenesin - expectorant. Phenylephrine HCl - nasal decongestions. Relievers headache, fever & sore throat. Controls cough. Relieves nasal & chest congestion. Thins & loosens mucus. See new information. Parents: Learn about teen medicine abuse. www.StopMedicineAbuse.org. Questions? 1-866-Mucinex (1-866-682-4639). You may also report side effects to this phone number. Health. Hygiene. Home. 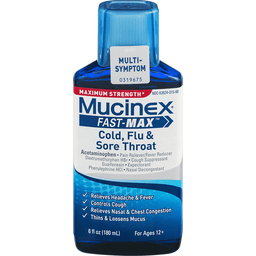 Please visit our web site www.mucinex.com. Other Information: Store at 68-77 degrees F (20-25 degrees C). Misc: 600 mg guaifenesin & 30 mg dextromethorphan HBr extended-release bi-layer tablets. Controls cough; thins and loosens mucus; immediate and extended release. Questions? 1-866-Mucinex (1-866-682-4639). You may also report side effects to this phone number. Health. Hygiene. Home. Parents: Learn about teen medicine abuse. www.StopMedicineAbuse.org. Please visit the web site www.mucinex.com. Made in England. Other Information: Each 15 ml contains: sodium 15 mg. Store at room temperature. Does not meet USP requirements for light resistant packaging. Misc: Dextromethorphan HBr - cough suppressant. Cough relief. Cough suppressant. 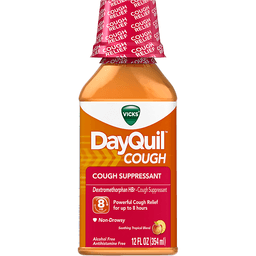 8 Hr: Powerful cough relief for up to 8 hours. Non-drowsy. Alcohol free. Antihistamine free. Parents: Learn about teen medicine abuse. www.StopMedicineAbuse.org. www.vicks.com. Other Information: Store between 68-77 degrees F (20-25 degrees C). Misc: For ages 12+. Acetaminophen - Pain reliever/fever reducer. Dextromethorphan HBr - Cough suppressant. Guaifenesin - Expectorant. Phenylephrine HCl - Nasal decongestant. Relieves headache, fever & sore throat. Controls cough. Relieves nasal & chest congestion. Thins & loosens mucus. Maximum strength (per 4-hour dose). Read new information. Questions? 1-866-Mucinex (1-866-682-4639). You may also report side effects to this phone number. Parents: Learn about teen medicine abuse. www.StopMedicineAbuse.org. www.mucinex.com. Made in England. Other Information: Each caplet contains: sodium 4 mg. Store at room temperature. Misc: Acetaminophen, phenylephrine HCl, dextromethorphan HBr, guaifenesin. Headache, fever, sore throat, minor aches & pains. Nasal/sinus congestion & sinus pressure. Cough. Chest congestion. Non-drowsy. www.vicks.com. Parents: Learn about teen medicine abuse. www.StopMedicineAbuse.org. Other Information: Each Caplet Contains: sodium (3 mg). Contains FD&C yellow 5 aluminum lake (tartrazine) as a color additive. Store between 68-77 degrees F (20-25 degrees C). Do not use if carton or blister unit is opened or broken. Misc: Acetaminophen, phenylephrine HCl, guaifenesin, dextromethorphan HBr - pain reliever/fever reducer, nasal decongestant, expectorant, cough suppressant. Sinus pressure & congestion. Sinus headache. Sore throat. Chest congestion. Cough. Non-drowsy. 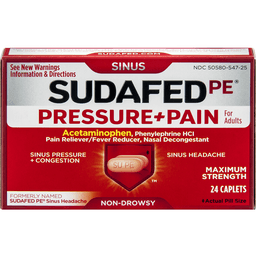 The makers of the Sudafed family of products have been dedicated to reducing sinus pressure for over 50 years. Learn more about our full range of effective sinus products at Sudafed.com. sudafed.com. Parents: Learn about teen medicine abuse. www.StopMedicineAbuse.org. 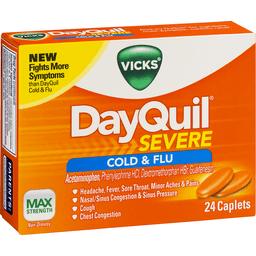 Does not contain pseudoephedrine. Made in Italy. Other Information: Each 15 ml contains: sodium 47 mg. Store at room temperature and do not refrigerate. Misc: Acetaminophen, phenylephrine HCl, dextromethorphan HBr, guaifenesin. Headache, fever, sore throat, minor aches & pains. Nasal/sinus congestion & sinus pressure. Cough. Chest congestion. Non-drowsy. Alcohol free. www.vicks.com. Parents: Learn about teen medicine abuse. www.StopMedicineAbuse.org. Other Information: Store between 68-77 degrees F (20-25 degrees C). Do not use if carton is opened or if blister unit us broken. Misc: Pain reliever/fever reducer, nasal decongestant. Acetaminophen, phenylephrine HCl. Sinus. Sinus pressure + congestion. Sinus headache. Formerly named Sudafed PE sinus headache. Non-drowsy. 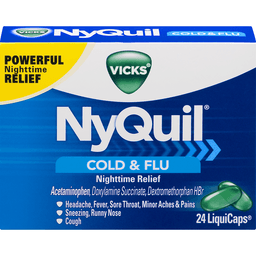 Does not contain pseudoephedrine. 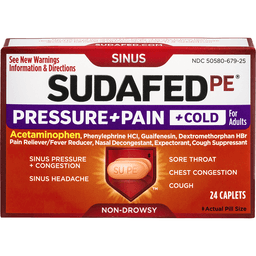 The makers of the Sudafed family of products have been dedicated to reducing sinus pressure for over 50 years. Learn more about our full range of effective sinus products at Sudafed.com. Sudafed.com. Other Information: Each 15 ml Contains: sodium 18 mg. Store at 68-77 degrees F (20-25 degrees C). Misc: Dextromethorphan HBr - cough suppressant, doxylamine succinate - antihistamine, acetaminophen - pain reliever/fever reducer. Decongestant-free cold symptom relief for people with high blood pressure. Relieves: sore throat; cough; sneezing; runny nose; body aches, pains, headache and fever. Alcohol 10%. See new warnings information. Questions or comments? 1-800-317-2165 (Mon-Fri 9 am-5 pm EST). Parents: Learn about teen medicine abuse. www.StopMedicineAbuse.org. 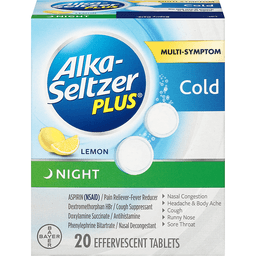 Alka-Seltzer Plus® Night Cold & Flu Formula Liquid Gels. See new warning. Acetaminophen/Pain reliever-fever reducer. Dextromethorphan hydrobromide/cough suppressant. Doxylamine succinate/antihistamine. Phenylephrine HCl/Nasal decongestant. Nasal congestion. Cough. Runny nose. Headache & body ache. Sore throat. Bayer. Parents: Learn about teen medicine abuse. www.stopmedicineabuse.org. Does not contain aspirin. 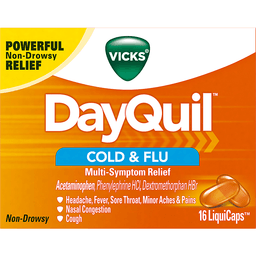 Use: Temporarily relieves these symptoms due to a cold or flu: Minor aches and pains. Headache. Nasal and sinus congestion. Cough. Sore throat. Runny nose. Sneezing. Temporarily reduces fever. Questions or comments 1-800-986-0369 (Mon-Fri 9AM - 5PM EST). Bayer, the Bayer Cross and Alka-Seltzer Plus are registered trademarks of Bayer. Other Information: Each caplet contains: sodium 3 mg. Store between 68-77 degrees F (20-25 degrees C). Do not use if carton or blister unit opened or broken. Misc: Acetaminophen, dextromethorphan HBr, phenylephrine HCl, guaifenesin. 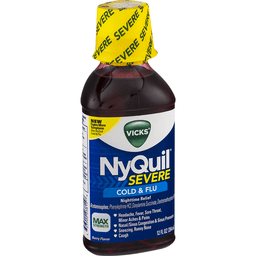 Pain reliever-fever reducer, cough suppressant, nasal decongestant, expectorant. For adults. Head + body aches. Fever + sore throat. Cough. Nasal congestion. Mucus + chest congestion. See new warning. Heritage of care. History of relief. How can we help? 1-877-895-3665. Snap this code or text tycold3 to 87715. MSG & data rates may apply. Text help for help. Text stop for stop. Parents: Learn about teen medicine abuse. www.StopMedicineAbuse.org. Questions or comments? Call 1-877-895-3665 (toll-free) or 215-273-8755 (collect). Made in Italy. 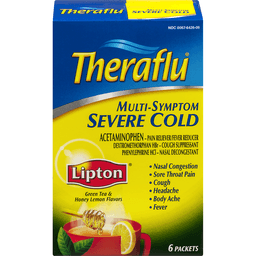 Theraflu® Multi-Symptom Severe Cold Tea. Lipton® Green Tea & Honey Lemon Flavors. Acetaminophen-Pain Reliever/Fever Reducer. Dextromethorphan HBr-Cough Suppressant. Phenylephrine Hcl-Nasal Decongestant. Nasal Congestion. Sore Throat Pain. Cough. Headache. Body Ache. Fever. 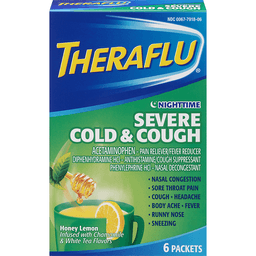 Theraflu® provides powerful relief from your severe cold and flu symptoms. 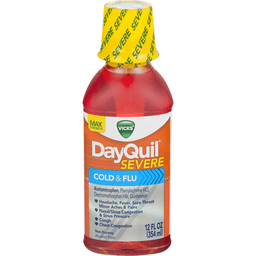 Uses: Temporarily relieves these symptoms due to cold: Minor aches and pains, Minor sore throat pain, Headache, Cough due to minor throat and bronchial irritation. Temporarily reduces fever. Read all warnings and directions on carton before use. Keep carton for reference. Do not discard. Other information: Each packet contains: Potassium 10 mg, sodium 19 mg. Phenylketonurics: Contains phenylalanine 20 mg per packet. Lipton is a registered trademark of the Unilever Group of Companies and is used under licence. Questions or comments call 1-800-452-0051. Parents: Learn about teen medicine abuse www.stopmedicineabuse.org. www.theraflu.com. ©2015. Other Information: Store between 68-77 degrees F (20-25 degrees C). Misc: (Per 4-hour dose). For ages 12+. Acetaminophen - Pain reliever/fever reducer; Guaifenesin - Expectorant; Phenylephrine HCl - nasal decongestant. Relieves headache & fever. Relieves nasal & chest congestion. Thins & loosens mucus. Questions? 1-866-Mucinex (1-866-682-4639). You may also report side effects to this phone number. Keep outer package for complete product information. Made in England. 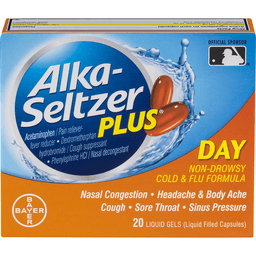 Alka-Seltzer Plus® Day Cold & Flu Non-Drowsy Liquid Gels. See new warning. Acetaminophen/pain reliever-fever reducer. Dextromethorphan hydrobromide/cough suppressant. Phenylephrine HCl/nasal decongestant. Nasal congestion. Headache & body ache. Cough. Sore throat. Sinus pressure. Bayer. Parents: Learn about teen medicine abuse. www.stopmedicineabuse.org. Does not contain aspirin. 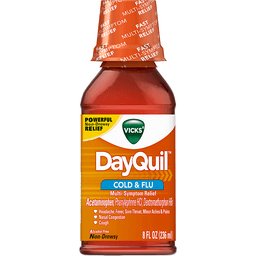 Uses: Temporarily relieves these symptoms due to a cold or flu: Minor aches and pains. Headache. Cough. Sore throat. Nasal and sinus congestion. Temporarily reduces fever. Questions or comments 1-800-986-0369 (Mon-Fri 9AM - 5PM EST). 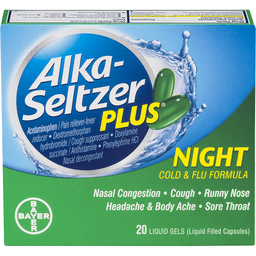 Bayer, the Bayer cross and Alka-Seltzer Plus are registered trademarks of Bayer. 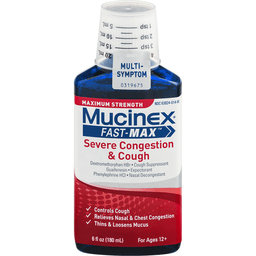 Mucinex® Fast-Max® Severe Congestion & Cough Maximum Strength. Multisymptom Relief. 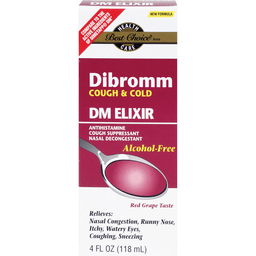 Dextromethorphan HBr - Cough Suppressant. Guaifenesin - Expectorant. Phenylephrine HCI - Nasal Decongestant. Controls Cough. 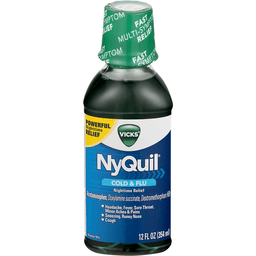 Relieves Nasal & Chest Congestion. Thins & Loosens Mucus. For Ages 12+. 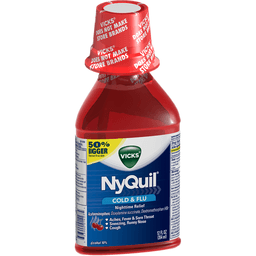 6 FL OZ (180 ml). Uses: Helps loosen phlegm (mucus) and thin bronchial secretions to rid the bronchial passageways of bothersome mucus and make coughs more productive. Temporarily relieves: Cough due to minor throat and bronchial irritation as may occur with the common cold or inhaled irritants. The intensity of coughing. 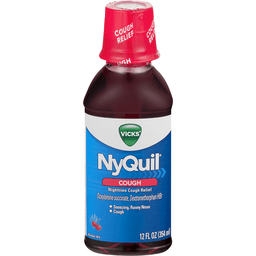 The impulse to cough to help you get to sleep. Nasal congestion due to a cold. Other information: Each 20ml contains: sodium 14mg. Dosing cup provided. Parents: Learn about teen medicine abuse www.stopmedicineabuse.org. Questions 1-866-MUCINEX (1-866-682-4639). You may also report side effects to this phone number. 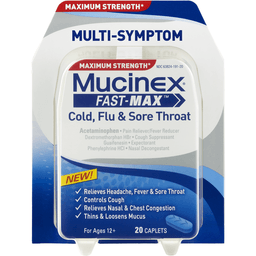 Please visit our web site www.mucinex.com. ©RB 2012. Other Information: Each 20 ml contains: sodium 12 mg. Store between 68-77 degrees F (20-25 degrees F). Dosing cup provided. Do not refrigerate. Misc: Acetaminophen - Pain reliever/fever reducer. 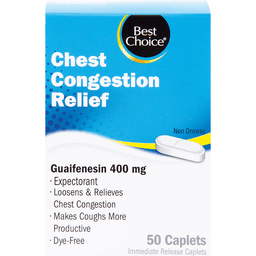 Guaifenesin - Expectorant. Phenylephrine HCl - Nasal decongestant. For ages 12+. Relieves headache & fever. Relieves nasal & chest congestion. Thins & loosens mucus. Maximum strength (per 4-hour dose). Questions? 1-866-mucinex (1-866-682-4639). You may also report side effects to this phone number. Health. Hygiene. Home. Please visit our website www.mucinex.com. Other Information: Store between 68 to 77 degrees F (20 to 25 degrees C). Protect from freezing. Protect from excessive moisture. Misc: Expectorant, cough suppressant. 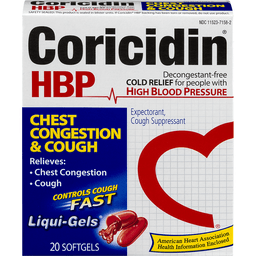 Decongestant-free cold relief for people with high blood pressure. 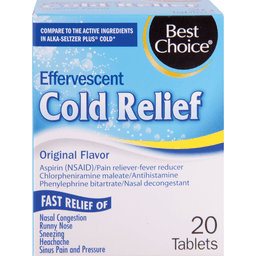 Relieves: chest congestion; cough. Controls cough fast. American Heart Association health information enclosed. Questions or comments? Call 1-800-317-2165 between 8:00 AM and 5:00 PM Central Standard Time, Monday through Friday. 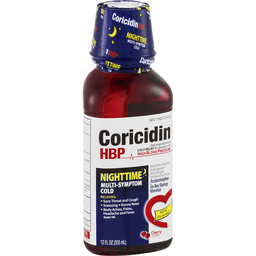 For more information, visit www.coricidinhbp.com. 100% recycled paperboard. Parents: Learn more about teen medicine abuse: www.StopMedicineAbuse.org.